Mumbai: In a move that may see yet another significant acquisition in the Indian drug industry, Bangalore-based Strides Arcolab Ltd is in talks with foreign companies and private equity investors to divest a key part of its business. Strides, with revenue of around ₹ 2,000 crore, will retain its injectables business while selling all its other segments, both in India and abroad, at a deal size that would value the firm at ₹ 5,200 crore, said two persons with direct knowledge of the matter. At Friday’s closing price, the company’s market value was ₹ 2,503.96 crore. The promoter holding in the company was 28.43% on 30 September. Jefferies India has received the mandate to represent Strides in negotiations. Jefferies declined to comment for this story. “The management had nothing to comment on the subject," said a Strides spokesperson in an email on 7 December. “Strides is in restructuring mode by which it will try to leverage the competencies it has built over a period of time globally and may retain one of its core businesses," said a person close to the company, who didn’t want to be named. “Strides will focus on its injectables business and sell other parts to interested parties," said the second person close to the development. Other parts of the business include the pharma generics business, which includes contract research and manufacturing services, and intellectual property-led formulations. “The process started last week and we are seeing both strategic and private equity interest from international players," he said. The Strides units will be sold to various buyers, according to the people familiar with the plan. The company will also explore selling its businesses overseas, including Australia, Africa and South-East Asia. “The potential bidders see a value at twice its current market capitalization," said the second person cited above. At least three foreign drug makers, including Merck KGaA, have eyed the firm in the past. Merck in fact had looked at the assets of the firm, said a corporate adviser with a foreign consultancy firm. “We don’t comment on market speculation," said Merck’s official spokesperson in India. Strides’ overseas businesses, with registrations in various high-value markets, are also potential targets for large PE firms that make buyouts in the pharma industry, the corporate adviser said. In a September presentation to investors, Strides reported that its specialities segment accounted for around 41% of revenue in the first half of the calendar year, a 33% jump over revenue for the corresponding half last year. The generics segment earned ₹ 658 crore for the period, a 26% increase over last year’s revenue in the same period. However, for the quarter ended 30 September, it posted a net loss of 65.2 crore, down from a profit of ₹ 14.61 crore in the quarter ended June. Australia accounted for 26% of revenue in calendar year 2010, while North America accounted for 23%. Europe and South Africa accounted for 11% and 2%, respectively, for the same period. According to an analyst at a foreign brokerage, while Strides’ investment in the sterile injectables business is a progressive step, concerns remain on the debt-equity ratio. “If the company does sell portions of this business, it will definitely be a breather for its debt-equity position," the analyst said. He did not want to be named as he is not authorized to talk to the media. The company’s debt-equity ratio stood at 1.74 on 30 June. “Historically, the company has disappointed investors; it has promised a lot but not delivered. That is why the stock does not go beyond eight to nine times the P-E (price-earnings multiple)," added the analyst. In 2005, Strides had agreed to merge with Matrix Laboratories Ltd, which was acquired by US drug maker Mylan Inc. a year later. The Strides-Matrix merger was called off due to valuation issues. 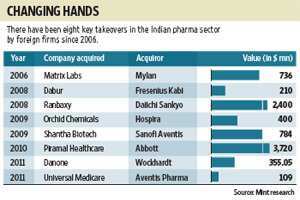 There have been at least eight key foreign takeovers in the Indian drug industry in the last five years. The increase in such deals had also led the government to change its FDI policy, amending rules for restricting investment in existing companies in this space on concerns of a likely rise in drug prices. Strides shares closed at ₹ 413.00 a piece on BSE on Monday, down 3.72%.